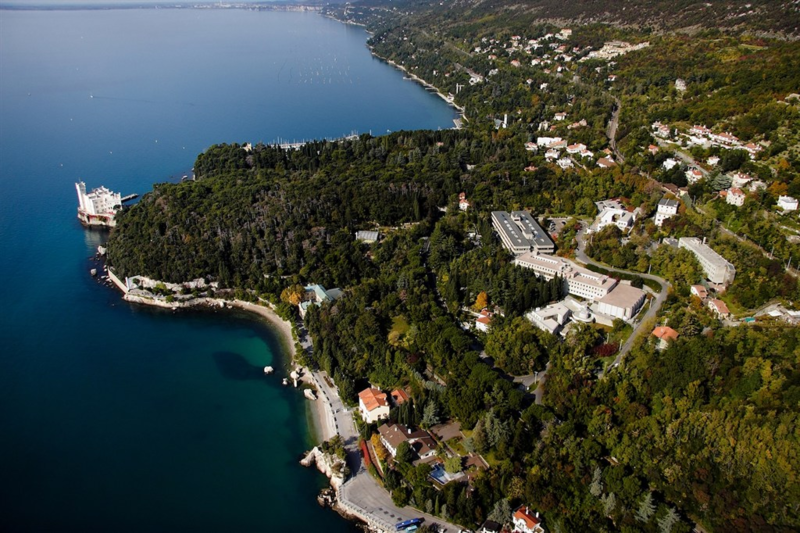 The Abdus Salam International Centre for Theoretical Physics (ICTP) and the International Atomic Energy Agency (IAEA) jointly organized this Advanced School and Workshop held at ICTP in Miramare, Trieste, Italy, from 16 to 27 March 2015. The Advanced School in the first week brought together experts in experimental and theoretical plasma spectroscopy to train early-career plasma scientists in the most recent developments and results in the field. The Workshop in the second week provided opportunities for participants to present their work, discuss current needs in plasma diagnostics, and motivate further developments. For the advanced school the desired participants by application are young researchers at about the post-doc level working in the field of radiative processes of atomic ions in fusion, astrophysical and industrial plasma or warm and hot dense matter and with a good background in theoretical plasma spectroscopy already. The workshop in the second week is intended for more senior scientists in the field and is largely filled by invitation. A scientific contribution (talk or poster) is expected from each participant in the advanced school or the workshop. Location: ICTP - Miramare, Trieste, Italy. Directors: H.-K. Chung and B. J. Braams (IAEA), Yu. Ralchenko (NIST). Local organizer: J. Niemela (ICTP). Administrative support: Ms E. Brancaccio (ICTP). ICTP Activity Website (event a14254, SMR2745). Summary Report and Book of Abstracts. Group photos of the school and workshop. Click on an image to open or download the original. The purpose of the School and Workshop is to provide training and information exchange for plasma physicists, plasma spectroscopists, and other users of atomic data for fusion, astrophysics and laser and plasma applications to expand their knowledge of plasma spectroscopy and associated atomic science. With rapid development of experimental and theoretical techniques for plasma spectroscopic diagnostics as well as ongoing construction and/or upgrade of international (ITER) and national fusion machines, new space observatories and new laser user facilities a comprehensive yet reasonably compact overview of modern diagnostic methods will significantly contribute to improvement of analysis and understanding of plasma behaviour in fusion experiments, industrial devices, extraterrestrial objects and warm and hot dense matter. Computer code training (FLYCHK, CRETIN, GRASP2K, Cowan's codes). Valentin Aslanyan (UK), Matthew Carr (UK), Uddhab Prasad Chaulagain (France), Dipti (India), Tony Donnelly (Ireland), Bo Han (China), Dominic Heunoske (Germany), Konstantin Kurchikov (Russia), João Loureiro (Portugal), Uria Peretz (Israel), Matej Tomes (Czech Republic), Dobromił Radosław Załoga (Poland). Giuliano D'Ammando (Italy), Gonzalo Felipe Avaria (Chile), Girum Abebe Beyene (UK), Christian Brandt (Germany), Tapasi Das (USA), Xiaobin Ding (China), Maylis Dozieres (France), Marijana Gavrilović (Serbia), Itay Gissis (Israel), Heather Marie Johns (USA), Dass Sudhir Kumar (India), Maryna Ladygina (Ukraine), Sapna Mishra (India), Nilam Nimavat (India), Mark D Nornberg (USA), Jüri Raud (Czeck Republic), Maogen Su (China), Duixiong Sun (China), Yang Yang (China). Mohammed Koubiti (France), Wonwook Lee (Korea), Tsanko Vaskov Tsankov (Germany), Sanjeev Varshney (India). The Advanced School in the first week featured lectures and computer labs. Participants by application presented their work in a poster session. The Workshop in the second week offered invited and contributed talks and a poster session. The lectures and other talks were held in the Euler lecture room, Leonardo da Vinci Building (ICTP main building). The posters were in the corridor around the Budinich Lecture Hall, also in the Leonardo Building. The computer labs were held downstairs in the Adriatico Building. The active link for each presentation goes to a pdf file of the presentation: lecture, invited or contributed talk, poster, or supporting material for the computer lab. 08:30 - 09:30 E. Brancaccio: Registration and administrative formalities in the Main Lobby, Leonardo da Vinci Building. 09:30 - 10:00 Directors: Welcome on behalf of IAEA, overview of the school, introduction of participants. 10:00 - 10:30 Yu. Ralchenko, NIST, Gaithersburg, MD, USA: Overview of plasma spectroscopy. 11:00 - 12:00 H.-J. Kunze, Ruhr-University, Bochum, Germany: Experimental spectroscopy. 13:30 - 14:30 J. Ekman and P. Jönsson, Malmö University, Sweden: Atomic structure calculations: fundamental concepts. 16:00 - 17:30 All: Poster Session. See below. Posters can remain up throughout the event. 09:00 - 10:00 H.-J. Kunze: Diagnostic applications. 10:00 - 10:30 Yu. Ralchenko: Atomic collisions. 11:00 - 11:30 Yu. Ralchenko: Atomic collisions (continued). 11:30 - 12:30 J. Ekman and P. Jönsson: Atomic structure calculations using GRASP2K. 16:00 - 17:00 C. J. Fontes, LANL, Los Alamos, NM, USA: Computer lab 2: ATOMIC. 09:00 - 10:00 E. Behar, Technion, Haifa, Israel: Atomic processes in plasmas. 10:00 - 10:45 Yu. Ralchenko: Line shapes and broadening. 11:15 - 12:15 C. J. Fontes: Opacities: LTE and Non-LTE. 13:30 - 14:30 H. A. Scott, LLNL, Livermore, CA, USA: Radiation transport. 14:30 - 15:00 K. Koshelev, Troitsk, Russian Federation: Industrial plasma - is it something to respect? 15:30 - 16:30 K. Koshelev: Industrial plasma (continued). 16:30 - 17:30 All: Poster session (continued). 09:00 - 09:45 O. Marchuk, Forschungszentrum Jülich GmbH, Jülich, Germany: Magnetic fusion spectroscopy. 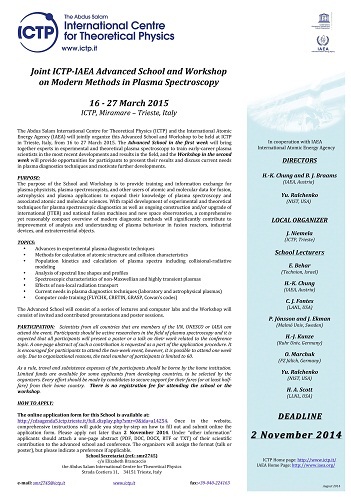 09:45 - 10:30 H.-K. Chung, IAEA, Vienna, Austria: Spectroscopy of dense plasmas. 11:00 - 11:45 C. J. Fontes: Opacities: means and uncertainties. 11:45 - 12:30 H. A. Scott: Radiation transport (continued). 14:00 - 15:30 H. A. Scott: Computer lab 3: CRETIN. 16:00 - 17:00 H.-K. Chung: Computer lab 4: FLYCHK. 11:00 - 12:00 O. Marchuk: Magnetic fusion spectroscopy (continued). 12:00 - 12:30 All: Conclusions. 08:30 - 09:00 E. Brancaccio: Registration and administrative formalities in the Main Lobby, Leonardo da Vinci Building. 09:00 - 09:40 Directors: Welcome on behalf of IAEA, Overview of the workshop, introduction of participants. 09:40 - 10:20 R. Dux, IPP Garching, Germany: Active spectroscopy on the neutral beams in ASDEX Upgrade. 11:00 - 11:40 H. Nishimura, Osaka University, Japan: Quantitative x-ray spectroscopy for energy transport in fast ignition plasma driven with LFEX PW laser. 11:40 - 12:20 Y. Aglitskiy, NRL, USA: Analysis of X-ray Nike spectra from highly charged high-Z ions. 14:00 - 14:40 S. Vinko, Oxford University, UK: Measuring fundamental properties of dense plasmas on X-ray Free-Electron Lasers. 14:40 - 15:20 B. I. Cho, GIST, Gwangju, Korea: Reverse saturable absorption of intense X-ray pulses in aluminum. 17:30 - 19:00 All: Reception. 09:00 - 09:10 J. Niemela, ICTP, Trieste, Italy: Welcome on behalf of ICTP. 09:10 - 09:50 C. J. Fontes, LANL, Los Alamos, NM, USA: Opacities for neutron star mergers. 09:50 - 10:30 H. A. Scott, LLNL, Livermore, CA, USA: Spectroscopic investigations of implosions on the National Ignition Facility. 11:00 - 11:40 J. Kaastra, SRON, Utrecht, The Netherlands: Progress in modeling astrophysical plasmas. 11:40 - 12:20 Yu. Ralchenko, NIST, Gaithersburg, MD, USA: Detailed spectra modeling in low-density plasmas. 14:00 - 14:40 E. Behar, Technion, Haifa, Israel: From Spectroscopic Diagnostics of Black Hole Winds to Their Physical Structure. 14:40 - 15:20 E. Stambulchik, Weizmann Institute of Science, Rehovot, Israel: Lineshape modeling for collisional-radiative calculations. 16:00 - 16:20 (C) Gonzalo Filipe Avaria, CCHEN, Santiago, Chile: Spectral characterization of pulsed plasma discharges at CCHEN and NSF Engineering Research Center for EUV Science and Technology. 16:20 - 16:40 (C) G. D’Ammando, CNR and University of Bari, Italy: Radiation transport, fluid dynamic and collisional-radiative model of radiative shock waves in H2/He mixture for aerospace and astrophysical plasmas. 16:40 - 17:00 (C) H. M. Johns, LANL, Los Alamos, NM, USA: Improved collisional line broadening for low-temperature ions and neutrals in the plasma modelling code ATOMIC. 17:00 - 17:20 (C) T. V. Tsankov, Ruhr University, Bochum, Germany: Atomic processes in low pressure argon afterglows. 09:00 - 09:40 R. Barnsley, ITER Organization, France: ITER spectroscopic diagnostics. 09:40 - 10:20 M. Goto, NIFS, Toki, Japan: Two categories of spectroscopic measurements and analyses for the fusion plasma diagnosis. 11:00 - 11:40 Y. Maron, WIS, Rehovot, Israel: Experimental determination of the ion temperature and hydromotion in an imploding plasma and implications to pressure and energy balance. 11:40 - 12:20 R. Prakash, CEERI, Pilani, Rajasthan, India: Simultaneous Estimations of Plasma Parameters using Quantitative Spectroscopy. 09:00 - 09:40 S. Brezinsek, Forschungszentrum Jülich GmbH, Jülich, Germany: Atomic and molecular spectroscopy in the scrape-off layer of high temperature fusion plasmas, results from TEXTOR and JET. 09:40 - 10:20 J. Ghosh, IPR, India: Estimation of oxygen transport coefficients using the O[4+] visible spectral line in the Aditya tokamak. 11:00 - 11:40 U. Zastrau, Jena and Hamburg, Germany: Electron trapping by strong Coulomb coupling in a relativistic laser plasma. 11:40 - 12:20 O. Renner, FZU, Czech Republic: Hot electron production at shock-ignition-relevant conditions characterized by high resolution spectroscopy and imaging. 14:00 - 14:40 S. Bastiani-Ceccotti, LULI, France: Analysis of the X-ray emission from well-characterized NLTE mid- and high-Z laser-produced plasmas. 14:40 - 15:20 H.-K. Chung, IAEA, Vienna, Austria: Atomic processes in dense plasmas. 16:00 - 16:20 (C) M. Koubiti, University of Aix-Marseille, France: Emission spectroscopy applied to divertor plasmas of magnetic fusion devices. 16:20 - 16:40 (C) S. Varshney, ITER-India, India: Current needs and developments in X-Ray Crystal Spectroscopy for ITER. 16:40 - 17:20 All: Discussion. 09:00 - 09:40 M. O'Mullane, University of Strathclyde, UK: Assembling atomic data for diagnosing and modelling fusion plasmas. 09:40 - 10:20 D. W. Savin, Columbia University, New York, NY, USA: A review of cosmically motivated measurements for atomic ionization and recombination using ion storage rings. 11:00 - 11:40 B. J. Braams, IAEA, Vienna, Austria: Steps towards uncertainty estimates for calculated atomic and molecular data. 11:40 - 12:20 All: Discussion. Poster sessions were held on Monday 16 March, Wednesday 18 March and Monday 23 March with posters staying up throughout the event. (P) V. Aslanyan and G. Tallents: Calculations of ionization time-scales in a laser-irradiated plasma. (P) G. Avaria, M. Grisham, J. Li, F. Tomase, V. Shlyaptsev, M. Busquet, M. Woolston and J. J. Rocca: Spectroscopic observations of homogeneous microcapillary plasma columns heated by ultrafast current pulses. (P) G. Avaria, Osvaldo Cuadrado, Eduardo Jara, A. Sepulveda, José Moreno, Cristian Pavez, Patricio San Martin and Leopoldo Soto: Spectral characterization of pulsed plasma discharges at the Chilean Nuclear Energy Commission (CCHEN). (P) G. A. Beyene, I. Tobin, L. Juschkin, Gerry O’Sullivan and Fergal O'Reilly: Plasma imaging and spectroscopic studies from laser-assisted vacuum-arc source (Abstract). (P) C. Brandt, O. Marchuk, A. Pospieszczyk, S. Brezinsek, M. Reinhart and B. Unterberg: Observation of Emission of Fast Atoms in the Linear Magnetized Plasma Device PSI-2 (Abstract). (P) M. Carr, N. Hawkes, R. Scannell, A. Patel, N. Conway and H. Meyer: CXRS Diagnostics on MAST (Abstract). (P) Uddhab Prasad Chaulagain: X-ray characterization of laser-driven hypersonic radiative shocks (Abstract). (P) T. Das, Y. Podpaly, J. Reader, J Gillaspy and Yu. Ralchenko: Identification of EUV spectral lines of highly charged tungsten from Zr-like W[34+] to Se-like W[40+] ions observed with an EBIT at NIST (Abstract). (P) Xiaobin Ding, Chenzhong Dong, Fumihiro Koike, Daiji Kato, Hiroyuki A. Sakaue, Izumi Murakami and Nobuyuki Nakamura: Visible M1 transition of the ground state and CRM of W[26+]-W[27+] ions. (P) Dipti, R. Srivastava, R. K. Gangwar and L. Stafford: Collisional radiative model for the diagnostics of ICP Krypton plasma using relativistic fine-structure cross-sections (Abstract). (P) T. Donnelly, G. O’Connell and J. G. Lunney: Nanosecond and femtosecond pulsed laser ablation of metals: Plume characterisation and nanomaterial synthesis. (P) Maylis Dozieres, M. Šmíd, T. Schlegel, F. Thais, F. Condamine, X. Na, O. Renner, and F. B. Rosmej: Hydrodynamics and X-ray emission from tampered copper foils irradiated by kJ-laser (Abstract). (P) M. R. Gavrilović, M. Cvejić and S. Jovićević: Single pulse laser-induced breakdown on the target in water. (P) Itay Gissis, A. Rikanati, I. Be’ery, A. Fisher and E. Behar: Spectroscopy of a nitrogen capillary discharge plasma aimed at a recombination pumped x-ray laser (Abstract). (P) Bo Han, Feilu Wang, David Salzmann and Gang Zhao: Modeling non local thermodynamic equilibrium plasma using the Flexible Atomic Code data (Abstract). (P) Dominic Heunoskeand J. Osterholz: Comparison of Transient Plasmas Produced by Nanosecond Laser Pulses and Hypervelocity Impact via Time-Resolved Emission Spectroscopy (Abstract). (P) H. M. Johns, D. P. Kilcrease, J. Colgan, E. J. Judge and J. E. Barefield II: Improved collisional line broadening for low-temperature ions and neutrals in the spectral modeling code ATOMIC (Abstract). (P) K. A. Kurchikov, A. S. Kovalev, A. N. Vasilieva: Determination of the metastable and resonance excited atomic states populations in CCP Ar discharge using OES techniques. (P) M. S. Ladygina, A. K. Marchenko, D. G. Solyakov, Yu. V. Petrov, V. A. Makhlaj, D. V. Yeliseyev and I. E. Garkusha:Investigations of plasma parameters and features of compression zone formation in MPC facility using the optical and spectroscopic methods of diagnostics. (P) Wonwook Lee and Duck-Hee Kwon: Diagnostics of Helium plasma by using optical line intensity ratio method (Abstract). (P) J. Loureiro, H. Fernandes, C. Silva, R. Gomes and T. Pereira: Spectroscopic imaging of liquid tin as plasma facing material on ISTTOK (Abstract). (P) Sapna Mishra, Sanjeev Varshney, T Sai Chaitanya, Namita Yadav, Gunter Bertschinger, Robin Barnsley and Vinay Kumar: Design and simulation of Cu target X-ray source for ITER X-ray crystal spectrometers (Abstract). (P) M. D. Nornberg: Charge Exchange Recombination Spectroscopy modeling challenges on MST (Abstract). (P) Uria Peretz: Coronae of stars with super-solar elemental abundances (Abstract). (P) N. Ramaiya, R. Dey, R. Manchanda, M.B. Chowdhuri, S. Banerjee, N. Virani and J. Ghosh: Investigation of the role of neutrals in edge transport barriers using PMT array based spectroscopic system in Aditya tokamak (Abstract). (P) J. Raud, I. Jõgi, R. Talviste and D.Trunec: Mid-pressure Ar/N2/H2 RF discharge characterization. (P) M. G. Su, X. N. Cao, and C. Z. Dong: 4f and 5p inner-shell excitations of W-W[3+] ions (Abstract). (P) Dass Sudhir, M. Bandyopadhyay, G. Bansal, K. Pandya, A. Yadav, J. Joshi and A. Chakraborty: Doppler Shift Spectroscopy Diagnostic for Indian Test Facility (INTF). (P) Duixiong Sun, Maogen Su and Chenzhong Dong: Emission signal enhancement in double-pulsed laser induced plasma on collinear geometry (Abstract). (P) Matej Tomes, Vladimir Weinzettl, Tiago Pereira and Martin Imrisek: High resolution spectroscopic measurements of edge plasma rotation and ion temperature in L- and H- modes at the COMPASS tokamak (Abstract). (P) Yang Yang, Jun Xiao, Jacek Rzadkiewicz, Ke Yao, Roger Hutton and Yaming Zou: Preliminary observations of x-ray transitions from middle charged tungsten ions on Shanghai EBIT (Abstract). (P) D. R. Załoga, E. Skladnik-Sadowska, K. Malinowski, R. Kwiatkowski, M. J. Sadowski, J. Zebrowski, M. Kubkowska, M. Paduch, V. A. Gribkov and M. S. Ladygina: Optical spectra of plasma-streams and plasma from targets in plasma-focus experiments (Abstract). The conference is held in the Leonardo Building on the ICTP campus. The campus is located next to Miramare Park and Castle, about 7 km from the centre of Trieste. Image courtesy, credit and/or copyright (c) ICTP. Source: ICTP Media Centre (> Picture Gallery > ICTP Campus). List of meetings in 2015 and 2016 that are relevant to atomic processes and atomic spectroscopy in plasmas. The present conference is advertised on several meetings lists and these lists may also be a good source of information about other events of related interest. For problems or questions regarding this web page contact the A+M Data Unit.